Music to write by. And other rituals. I was recently interviewed by a fellow author and blogger David James (check out his beautiful blog and debut novel Light of the Moon here), who asked me about my writing rituals. I honestly stared at that question for what seemed like forever because I just couldn’t think of what my rituals might be. I work 3/4-time as an associate professor and have two young children under the ages of six. Not a lot of time to write until I’m done with work and after the kids go to bed. I never thought of having a ritual before. I just write when I can, often in little snippets throughout the day. So I think I answered David’s question something to the effect of: put the kids to bed, grab a snack, grab the laptop and start typing? But as I thought about this more, I realize that there are certain things that I do that help me write better. I write better if I’m comfortably seated in my favorite armchair. I write better if I wear my favorite headphones and am plugged in to my favorite playlist (currently consisting of a mix of songs from Arcade Fire, DeVotchKa, Muse, and The Killers). I write better if I set a little half-hour timer and do a quick sprint to get myself going. I write better when I’m feeling peaceful about things, which means working out any stress from the day with a walk or a hot shower. 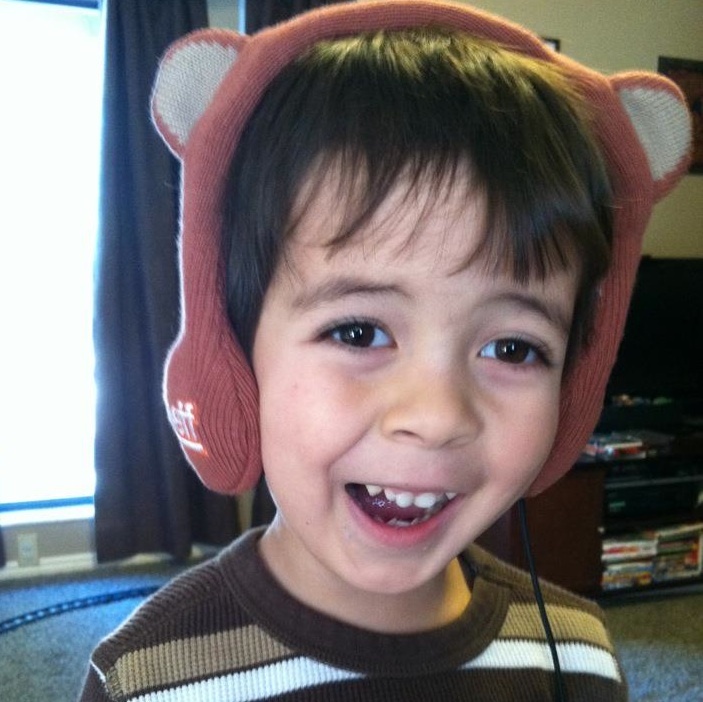 My son wearing modeling my headphones. They look like his, but they’re really mine. So, as it turns out I DO have writing rituals. And this makes me feel better for some reason. I think it’s because rituals and traditions ground us and allow us to feel like we have some semblance of control in our crazily busy lives. Like around the holiday season. Speaking of which, we’ll be taking a break in our blogging until the Monday after Thanksgiving. Hope everyone has a lovely day with friends and/or family, and Happy Thanksgiving! Thankful for my little writing rituals. What are yours? ← I Hope I Get an "A"! I have a writing playlist on both iTunes and spotify – Mozart is quite prevalent as well as some of the most famous arias, piano and violin concertos…pretty much classical and pretty much never speaking in English or my brain overloads.